Jackson Hole was rated the #1 resort in North America in 2013 in the annual Ski Magazine reader survey. With very dry conditions and very little terrain open in Tahoe, we decided to head northeast to where it had actually been snowing. 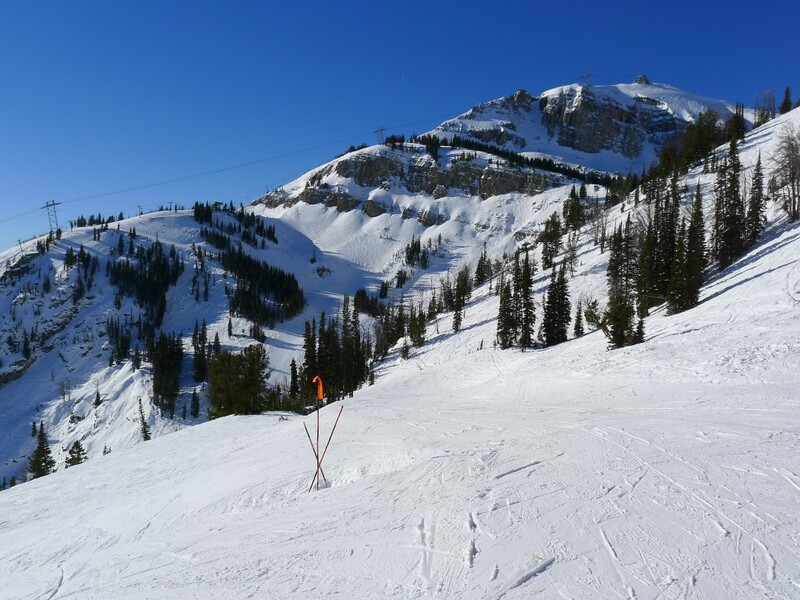 Jackson Hole had received about 160″ of snowfall by the time we visited during the busy Christmas week 2013. It was a 750 mile drive from South Lake Tahoe where we celebrated Christmas to the town of Jackson, WY. It’s a beautiful drive for the most part, and you can really make time in Nevada with a 75 MPH limit on I80. We arrived at night and woke up to a spectacular view of Grand Teton from our lodging at Spring Creek Ranch, which is up on a hill above the town. The restaurant there wins the prize of having the best view of any place we have ever eaten, and the food was great too. Jackson Hole is a few miles away from the town, and as you get closer you start to realize that you are in for a challenging day. The over 4,000 feet of vertical is completely visible from the base area and seems imposing. The steeper stuff is on the left under the tram, and the mellower terrain is on the right on Apre Vous. We only had one day to try to ski as much of the mountain as possible. I (Ron) spent a couple of days skiing at Jackson in March 2011 which was a great year for snow. That previous experience allowed us to hit some of the highlights and give AiRung at least an idea of what the place is about. It was a great day, but it would take many days to find the really sweet spots because there are a ton of trails heading off into the trees to unknown treasures or possibly terrors if you take the wrong one. Caution is necessary here so you don’t get cliffed-out. We started on the right at Apre Vous and had some great long groomer runs. This was paradise for us compared to what we had been skiing in Tahoe recently. Soft, natural snow and no rocks. Awesome. Working our way to the left side of the mountain there is a new high-speed quad just before the gondola which serves another pod of mostly intermediate terrain groomed to perfection. This new lift is a huge improvement over the old fixed-grip triple that used to be there. The long runs from the top of the gondola all the way to the bottom are great fun and are what we did just before lunch. Finding a spot for lunch was difficult. Seems like many of the places take reservations, and we didn’t have any. We did eventually find a place over by the tram, which was where we headed after lunch. Unfortunately the Christmas week crowds were in-force and the line wrapped all the way around the building to where we were having lunch. Every ski day we like to have a “project” run that is more ambitious and takes longer. Skiing the 4,139 feet top to bottom was that day’s project. It was a long wait in line, but it was worth it. 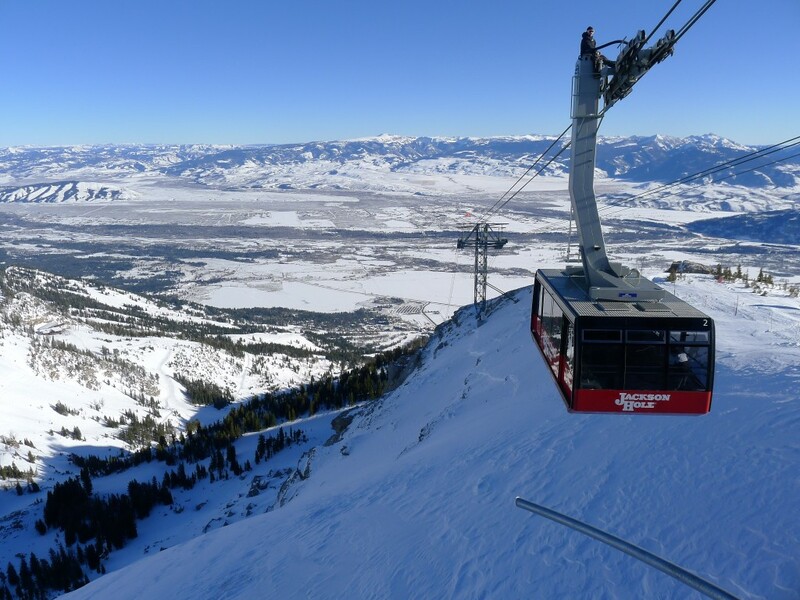 Getting off the tram at the top of Jackson Hole for the first time is something most people who have skied there always remember as being a bit scary and definitely exhilarating. Off the top to skier’s right Rendezvous bowl is the usual route down. Corbett’s is the other way down, but that is not really on the menu for us at our level. That side of the mountain has the Hoback’s and Alta Chutes, which are 2 memorable runs. When I skied JH in 2011 it had snowed 17″ over night. The Hoback’s is a popular destination on powder days because it is a huge apron of about 2,500′ vertical that takes a while to get tracked out. Alta Chutes is another one of those memorable very steep chutes that JH is famous for, but there is no mandatory air like there is at Corbett’s. Jackson Hole embodies the core values of North American skiing with deep snow, steep terrain, and locals that use every last bit of it. The lift network has been vastly improved in the past few years and even though it was Christmas week, the only lines we experienced were at the Tram. The enthusiasm and culture of skiing there is second to none and just watching people really taking skiing to the ultimate level is great fun. The scenery is fantastic and the town of Jackson is fairly authentic with a great variety of lodging, restaurants, and shopping. 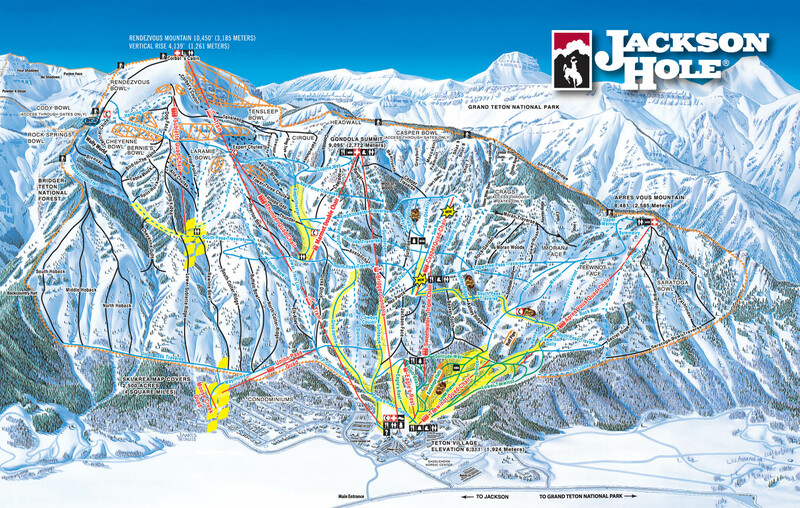 JH is actually a fairly small mountain with only 2,500 acres, which is comparable to one of our home resorts Kirkwood. There is almost no beginner terrain and not that much intermediate. Many of the “runs” are actually roads snaking down the mountain avoiding steeper drops. This all sounds pretty bad, but in reality the place skis bigger than it is and it’s not as limiting as the stats and map indicate. The lift ticket price also deserves special mention as it was the most we have ever paid. With the mandatory $5 charge for the plastic card, and with Holiday pricing, it came in at a whopping $117 per person. Ouch! We could not find any discount deals anywhere so just had to pay up at the window. Take a ride up the tram to the top and make a single run all the way to the bottom if you have upper-intermediate or greater abilities. There aren’t many places with that much contiguous vertical drop in one run, and the views at the top are not to be missed. For me, it is skiing Alta and Tower 3 chutes. They are smooth and very steep and really give you a feeling of accomplishment. For AiRung the groomers off the Apres Vous lift first thing in the morning were fantastic. Also memorable was the breakfast at Spring Creek Ranch with that spectacular view. Definitely. It’s close enough that we can just barely drive there in one day, so next time we are having really bad conditions in Tahoe I’m sure we will head over there. 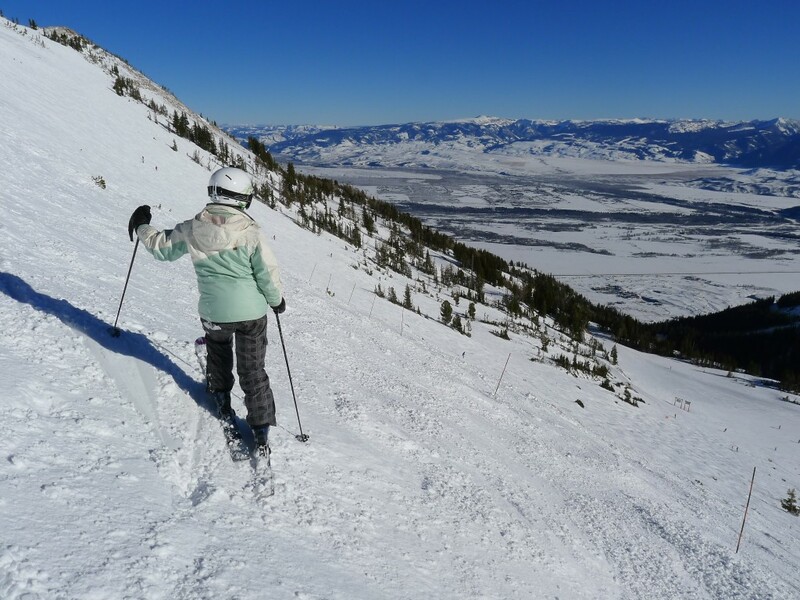 Skiing at JH is an experience that left us feeling completely satisfied. It’s one of the few resorts that we rate as a solid “5”.